Happy Fall! It’s time for crisp weather, apple picking, and of course, Pumpkin Spice Lattes. New England leaf peeping has a reputation for vibrant reds, yellows, and golds as the trees change their colors. 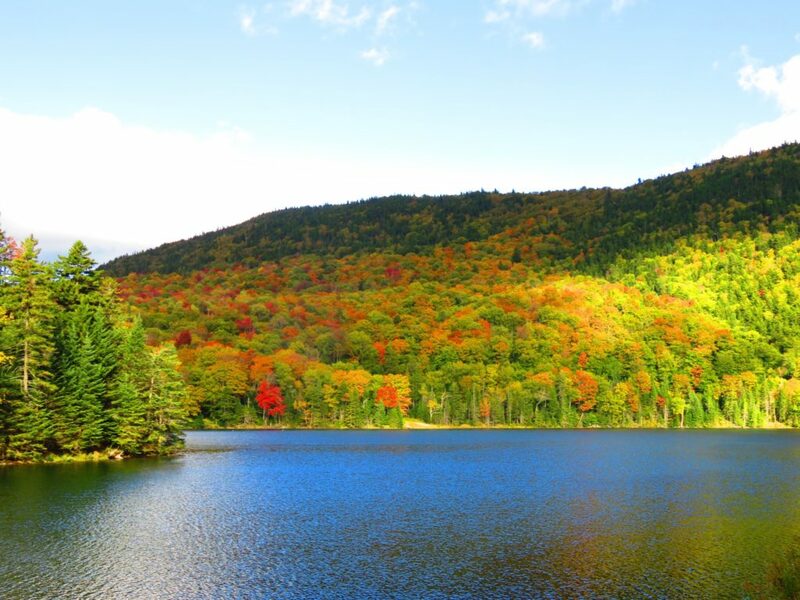 We took a weekend trip up to New Hampshire to experience the glory of New England leaf peeping this fall! The colors were just starting to turn and we captured some beautiful moments along our route. I’ll cover our driving route as well as some cute towns we stopped in for lunch and to walk around. This New England leaf peeping drive took us a full day, or about 8 hours. We really took it slow, stopping in several small towns and enjoying main streets and local eats. 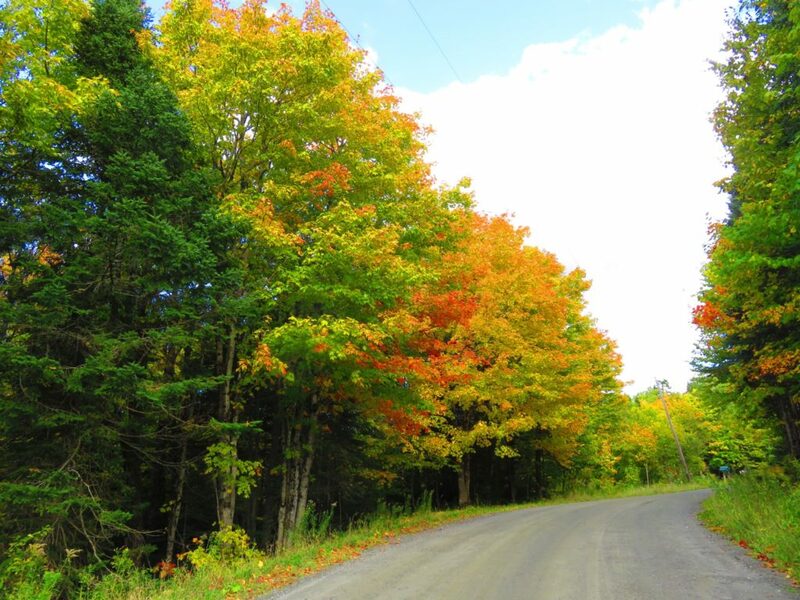 Time your leaf peeping right and you’ll be rewarded with rich colors along your route! The trees start to change in late September in the northern states and continue to change through late October as the colors change in the more southern states. We started our New England leaf peeping route in Jefferson, NH, which is about a 3 hour drive north of Boston. Jefferson is probably most well known for being the town that hosts Santa’s Village, a Christmas theme park in New Hampshire! If you have an extra day or have kids, Santa’s Village is a great place to spend a few fun hours! From Jefferson, drive north on Rt. 2 towards Lancaster, NH. 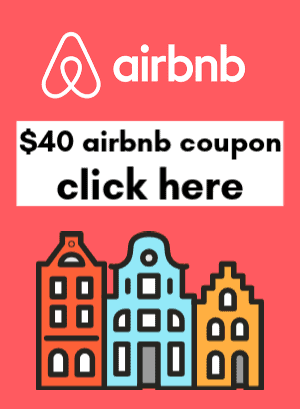 It’s only about a 15-minute drive, and you can stop downtown for a coffee and breakfast at the Polish Princess Bakery or the Granite Grind. Meander along the main street and if you’re visiting on a Saturday, stop by the local Farmer’s Market. You can find farm-fresh eggs, meats, honey, flowers, maple syrup, and hand-carved wood items. 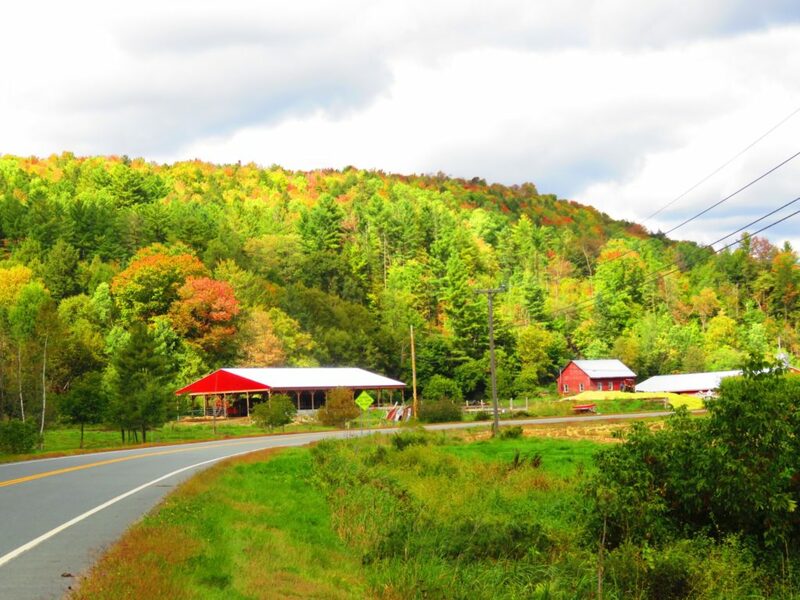 After checking out Lancaster, NH, continue the New England leaf peeping drive by hopping on 102 North and crossing into the Vermont border. Route 102 runs parallel to the more used Route 3, but 102 is a local road that follows along the river, which will be to your right along the drive. You’ll actually be quite close to the Canadian border as you head north! On our drive we saw a group of French Canadian cyclists enjoying the well-maintained roads for a fall ride. Take the chance to drive slowly up route 102 (well, not too slowly! And pull over for passing local cars who don’t care about your leaf peeping dreams). You’ll pass gorgeous runs of changing trees with several pull off areas for taking photos. Head towards Colebrook, NH as you pass back over the border. This is a perfect small town to stop in for lunch. if you just want some sweets check out Le Rendez Vouss Bakery. If you’re looking for a more substantial lunch, check out Wilderness for hearty soups, sandwiches, and salad options. After lunch and a walk around Colebrook, you can head back on the road on route 26 east towards Dixville Notch. There’s a lovely lake with pull-offs for photos, and several hiking/walking paths in the area. We stopped for a short (very vertical) walk that our pup loved! 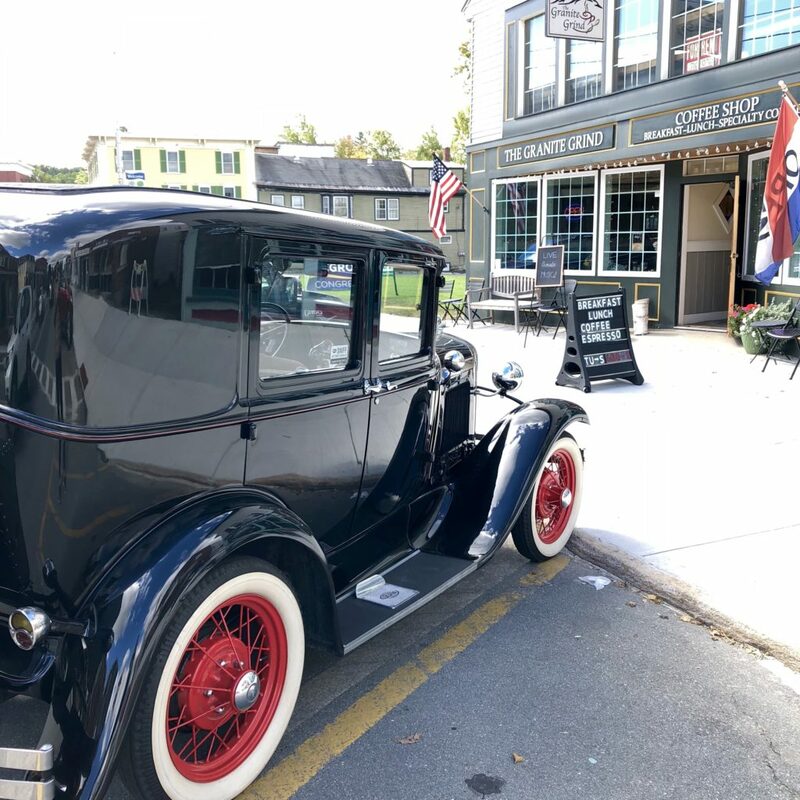 Next, drive on route 16 south towards Berlin, another quintessential New England town. Complete the loop back to Jefferson by driving west on route 2. 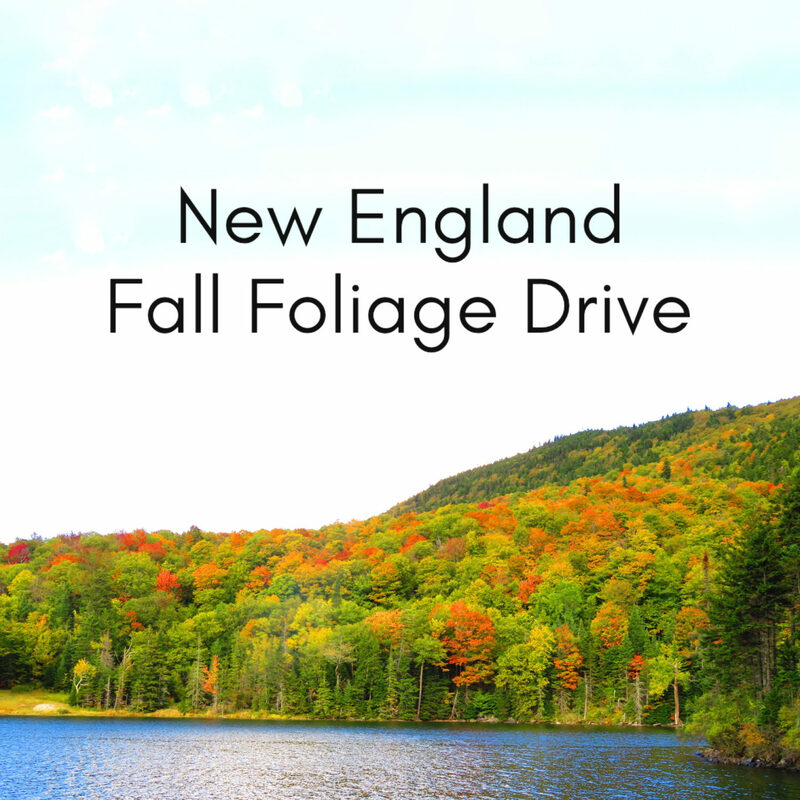 If you take this New England leaf peeping route, leave a comment and let me know what you think! Binoculars: You’ll want a pair of binoculars to zoom up close to trees and wildlife. We saw a Bald Eagle along our drive and I so wish I had my pair with me that day! Driving Sunglasses: I love brown lenses for driving. They tend to block glare while keeping colors vibrant. You’ll definitely want a pair to help with the bright fall skies! Water Bottle: Some of the stretched of driving can be long, so you’ll want to pack some water. I love these Camelbak insulated bottles. They keep water cool all day as long as they aren’t in a hot car. And look at this adorable cat pattern! Who cares if it’s for kids! Meep!